Yet another remake hits Hindi screens and tries its hand with lady luck. 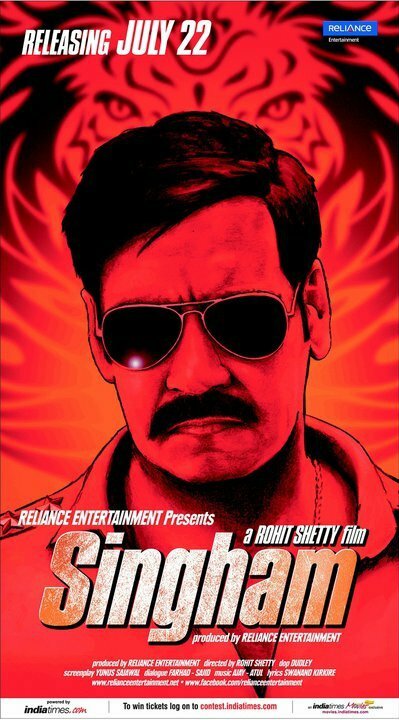 This time it is hit combo Rohit Shetty and Ajay Devgn in the action avatar, Singham. But it’s not the fact of being a remake that sets a film a part or be detrimental to any film. In the scheme of the things, the audience has somewhat gotten used to every third film falling into one of the categories remake, sequel or second episode. The challenge is making it enjoyable for even the select section of the audience that has seen the original, no matter the language or the period. For this hit jodi, the need to go a step forward and bring out something bigger and better than the Tamil Blockbuster starring Suriya Sivakumar and Sweety [Anushka] Shetty, is far greater with the memory Ghajini so strong even now. Considering the statement made by director Rohit Shetty that their version will be fierier in the action, the confidence the makers displayed added to the expectations. Yet, is confidence enough to win over the audience. After all, the story of an upright police officer becoming the thorn in the eye for a powerful criminal and their showdown isn’t exactly pioneer story-telling. With that said, this isn’t just about an honest cop. Its about a small town Shivgad’s sub-inspector, Bajirao Singham (Ajay Devgn), fierceful yet faithful to his roots, his family and his town. For him, criminals like Jaikant Shikhre (Prakash Raj) are unheard of. But when the Goan Kingpin tries to pull a fast one over the sub-inspector, Singham sets him straight and unknowingly gets on his bad side by hurting Shikhre’s ego. Do what you will but hurting Jaikant Shikhre’s ego is a no no with dire consequences. What happens when Singham gets transferred from his hometown to big city Goa, the kingdom that Shikhre has ruled with his smuggling, extortion and drug trafficking for so long forms the crux. It has been a while since seeing Ajay Devgn in an action based masala flick and he tries his best to deliver however, doesn’t quite make it. On one side the action is powerful, but when it comes to the emotive side, a normally free-flowing Ajay seems a little stiff. But he does well regardless. However, with a villain like Prakash Raj in front of you, it is tough to stand out. Prakash seriously goes to town in this film and what’s more he maintains his sinister side while appealing to the audience with his quirky lines. Debuting in Hindi as Ajay’s ladylove is Kajal Agarwal who looks pretty but is not only disappointing in her portrayal but the character itself is weak, a stark difference from the original in Tamil. In fact the whole ‘love story’ lacked any connection to the story and remained just as an extra fitting that took up time. Govind Namdev, Sudanshu Pandey and Sonali Kulkarni work effectively and play their parts. The rest are ok.
On the technicals side of things, Amar Mohile’s background helps the proceedings by giving the much needed punch. Camera work by Dudley is nice and editing by Steven Bernard could have been crisper. Music Ajay-Atul worked well for the title track but the rest don’t mesh well with the screenplay. Rohit Shetty has designed some eye-popping action for the film, making it a tough challenge for Jai Singh to execute, but it works nonetheless. While the dialogue by Farhad-Sajid is phenomenal is most situations, there are some that lack the punch they require. Screenplay writer Yunus Sajawal has made his intentions clear in the beginning itself, so it would be futile to think otherwise. But you can’t help but think the slow-motion button was permanently stuck on for a good portion of the second half. After delivering a exhilarating first half, this becomes a damp squib only revived by Prakash’s presence on screen. Even with all the masalafied drama inserted for the masses, the intensity dwindles because of it too. So while Singham does roar his loudest, it doesn’t always frighten. 17 queries in 0.604 seconds.